Looks like exactly my kind of polymer clay book! Thanks for the giveaway! Please include me. I have all the tools for polymer clay sitting collecting dust. :-) Winning this book might spark some ideas for polymer clay designs. Oh, yes. To learn from the best. It would be great if I won this book! I have wanted this book very badly and would love to win it. I would love to win this book! I have been eyeballing it for a while now! Pretty please count me in for this awesome giveaway! Thanks a bunch! I'd love a chance to win this book. I've not been real happy with anything I've done so far with my clay, so maybe I need to look at it in a different light. :) Thanks. 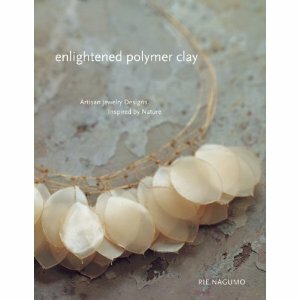 I'd love to win this book because I would like to know how to get polymer clay look so delicate and transparent. Thank you, Cyndi. Just started exploring poly clay this last year and am so excited by the millions of things to do with this material. Would love this book! And thanks for the opportunity. Been stalking this book for months wondering if I should buy it. If I have a chance to win it for free though, I'm all for it. consider me entered! I am working in Polymer and it is very exciting. Grown up Play Dough; & when working with it you find there are no mistakes, only creative designs. I love the translucent disks, they look like shells.I would like to know how to make them. I'd love to win this. Thanks for hosting the giveaway. putting it on my facebook and gonna tweet about it! !